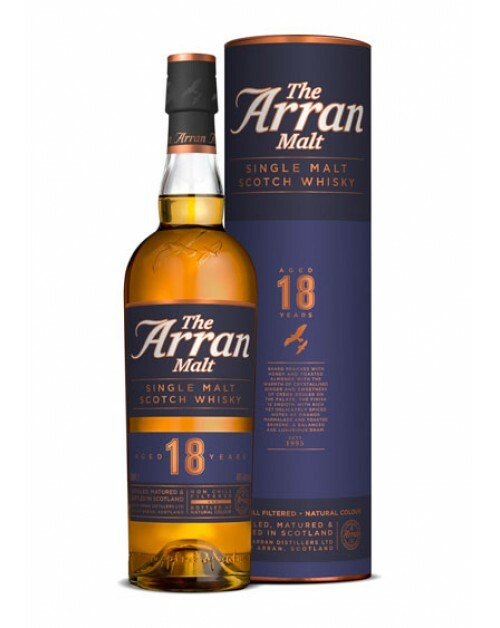 The Arran 18 year-old is a wonderfully balanced expression of The Arran Malt which displays the tremendous depth of character of the Arran Distillery. Caramelised citrus and tropical notes on a background of toasted oak have created an intense, well rounded dram with charm and personality. A balanced mix of the finest aged ex-Sherry and ex-Bourbon Casks, this fully mature expression of The Arran Malt is exceptional. Nose: Baked peaches with syrup and toasted almonds. Vanilla and light cinnamon spice. Palate: Sweetness, spice, baked peaches and citrus.